Kiosks were - and still are - a major part of any console's armoury when trying to woo potential buyers. Go into any game store these days and you'll undoubtedly see a PlayStation 4 or an Xbox One set up and running demos. The same was true back in the days of the Dreamcast, and I have fond memories of playing Virtua Striker 2 in HMV one afternoon back in 2000. Dreamcast Kiosks come in a number of guises, and they vary wildly from region to region. The ones I'm most familar with though, are the UK PAL-styled ones that adorned branches of Electronics Boutique and GAME, drawing me in with their glowing CRT screens and untold promise of 128-bit gaming, the likes of which I'd never seen before. Obviously they worked a treat on me (hence this place existing), but now we have something pretty special to share with you. 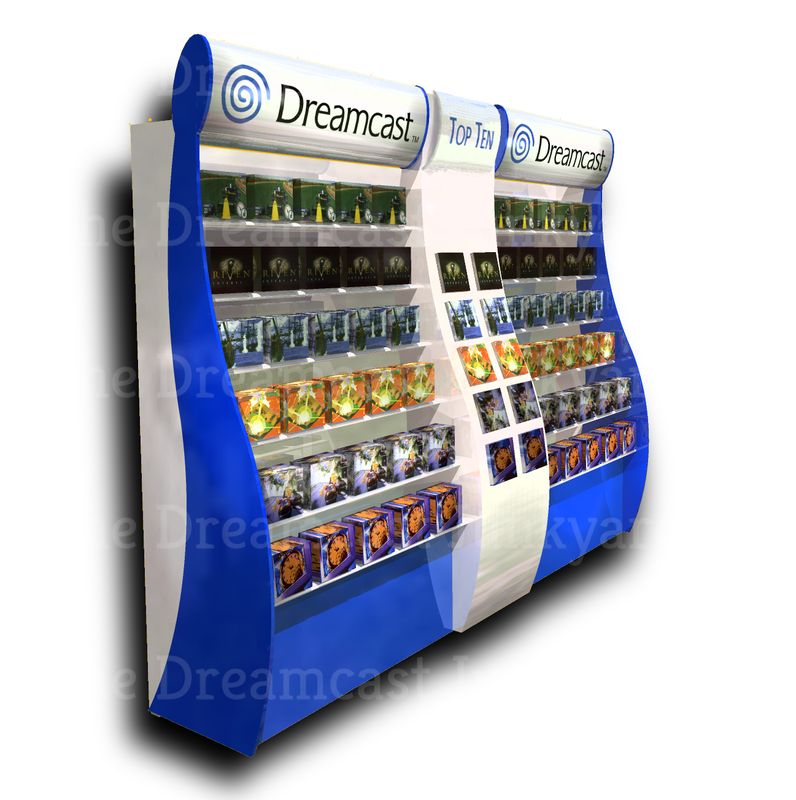 Here are some exclusive, never-before-seen computer generated images of the kiosks and in-store display cases that Sega Europe was intending to deploy across the continent with the aim of enticing the average gamer to part with cold, hard cash for a Dreamcast. This one you've probably seen and maybe even own. 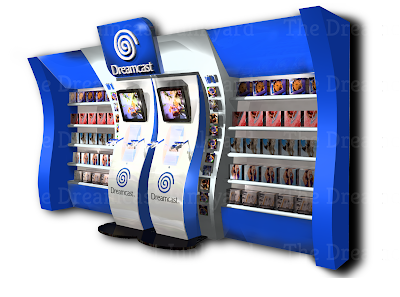 This is the standard Dreamcast kiosk that was used in most stores and launch events. 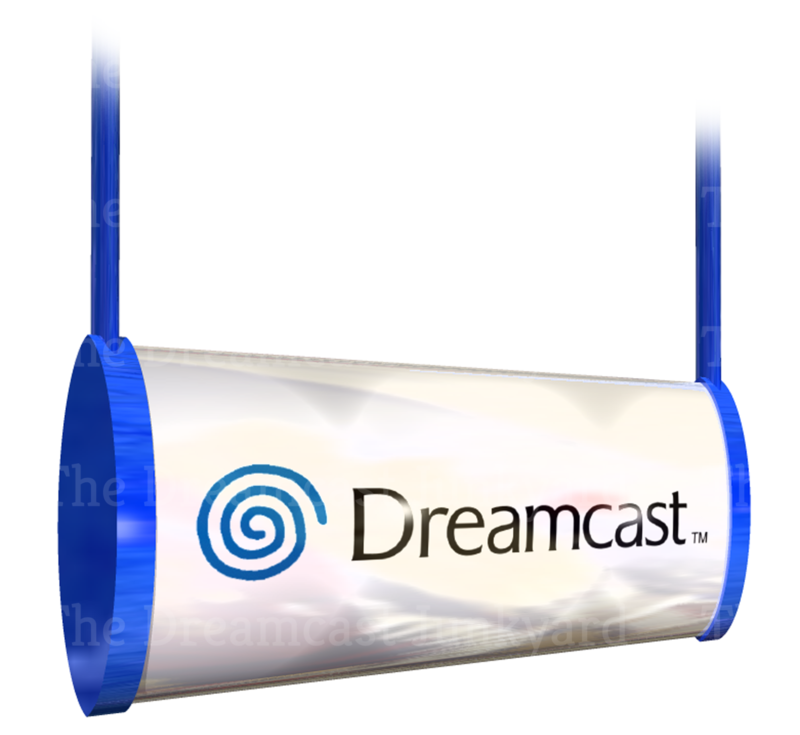 Containing a single CRT TV screen, a Dreamcast console inside the clear perspex bubble, and two controllers held in place by rigid wire protectors. 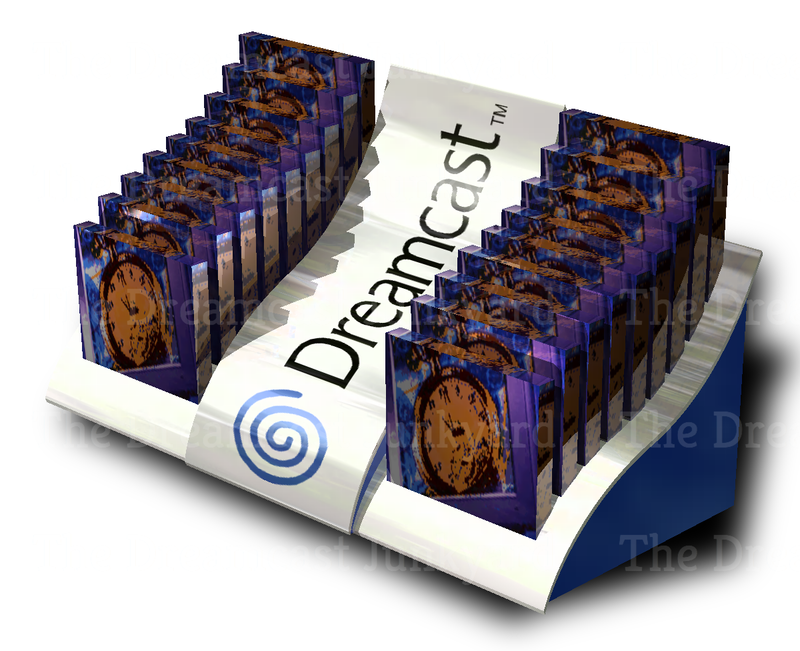 Next we have the design for the lightbox that sits atop most PAL-style kiosks and display units. I almost snagged one of these a few years ago at an event, but it had no plug or bulb and the seller wanted silly money so I told him to shove it. In the nicest possible way, you understand. Um. Now things get even more interesting. Here we have a display podium that has no screen but looks like it was intended to simply show off the design of the Dreamcast console. 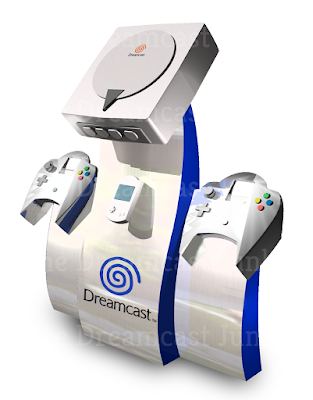 It's quite intriguing that the console itself has an orange swirl, even though the base unit has a familiar blue one. 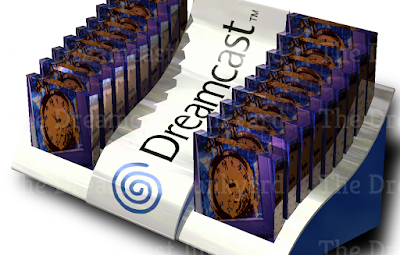 Again, I can't recall ever seeing one of these in reality, but if this does exist please let us know. 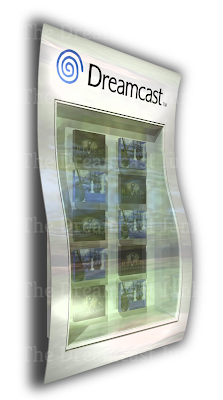 Following on from the podium, we have this display case that is labelled as 'Top 10.' I'm guessing the intention with this case was that the top ten games in the Dreamcast chart for a particular week or month would be displayed within, letting Dreamcast owners know which titles were the most popular at the time. Again, I never saw one of these. Finally, we have this interesting little counter top unit that's labelled 'CD dispenser.' Once again, I never saw anything like this in any of the game stores I visited back in the days of the Dreamcast, and I lived in a major city (Manchester) at the time so if this wasn't deployed there...then where was it? If at all? I'm guessing it never did see the light of day but it's still a fascinating glimpse at the type of thing Sega Europe had planned for the games stores across the continent. Thanks for these images go to a person who once again wishes to remain anonymous, but I'm sure they're reading this...so thank you. Thoughts on these? Did you see any of the stranger ones in the wild...or own them? Let us know in the comments, on Twitter or on Facebook. I've noticed the JAP games mostly have artful covers, NA mostly have over the top dramatic art (America F Yeah! ), and EU is "Throw a bunch of stuff on there and call it good." I haven't looked at all the PAL games so maybe the few I've been interested in are just out there. 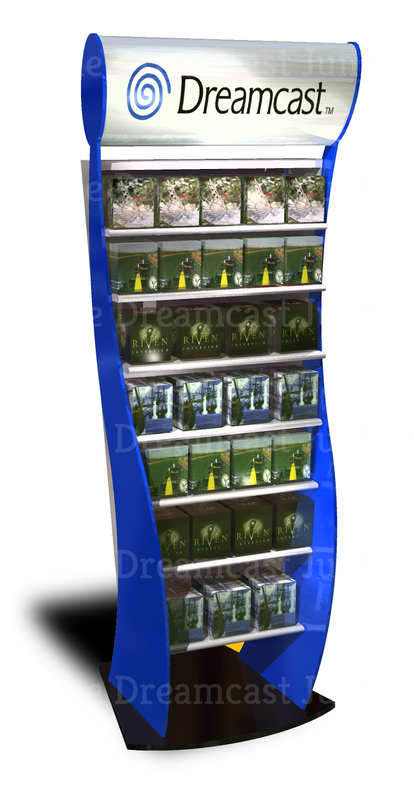 Do you happen to know where I can get measurements for the retail display kiosk? 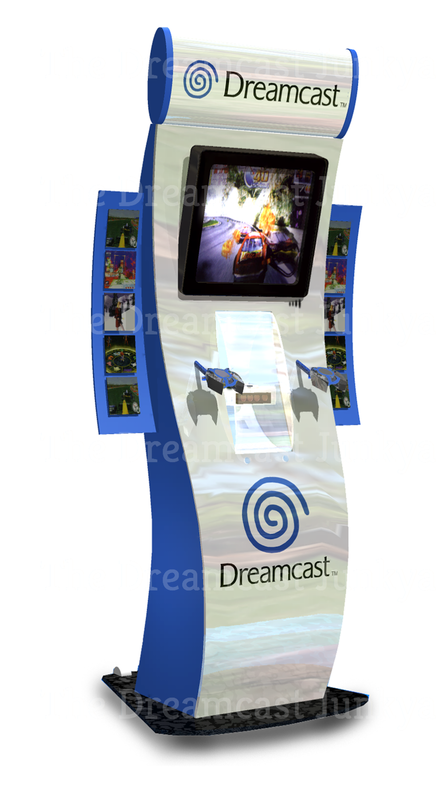 I am planning to reproduce one to use in my games room. The plan is to make it from a mix of standard MDF and bendy MDF for the curved front, the CRT monitor will most likely be replaced with an LCD. I am also considering having 2 arcade sticks and buttons mounted on the front to turn it in to an arcade style cabinet but with the option to also use the controllers. I figure that if I can keep the side lines very similar and with it the curve to the front, then it wont matter if I end up widening it a bit to fit a larger LCD and the arcade controls. If you can help with dimensions or better still if you are able to trace the side outline on to paper for me, I would be eternally grateful. shanosburgess@gmail.com hit me up if you can help. Looks like a screenshot of PS1's F1 97' being used on one of those boxes!